Derrick on Mulawin vs Ravena: \"Parang ako yung bagong sugo.\"
Derrick Monasterio on Mulawin vs Ravena: "Parang ako yung bagong sugo." 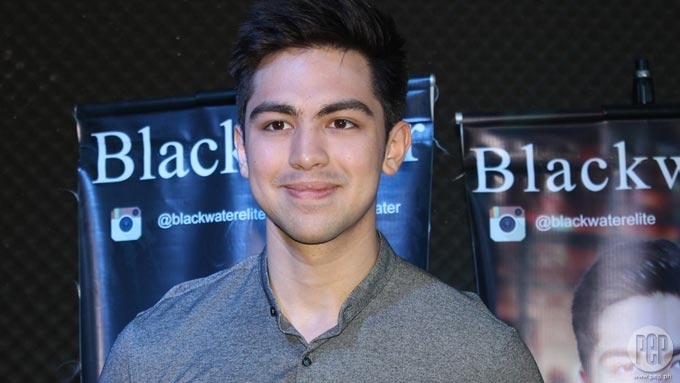 Derrick Monasterio feels "blessed" to be part of the upcoming GMA Network telefantasya Mulawin vs. Ravena as the son of Aguiluz and Alwina. With Mulawin vs. Ravena staged as one of GMA-7’s biggest teleseryes this year, Derrick Monasterio considers this project his biggest break yet. Derrick was introduced as one of the telefantasya's new characters during the cast reveal at the GMA Network Studio 7 last March 27. He plays Almiro, the son of Aguiluz and Alwina. The character briefly appeared during the film version of the telefantasya back in 2005 with Aguiluz and Alwina—originally portrayed by former Kapuso stars Richard Gutierrez and Angel Locsin—bearing a child at the end. On the series’ continuation, Derrick is set to breathe life to the character whom he described as "parang ako yung bagong sugo." At the launch of Blackwater Men’s newest TVC this April 4 at the PBA Cafe in Metrowalk, Pasig, the current Tsuperhero star spoke about his excitement for the telefantasya. “This is a different role, e,” he told PEP.ph (Philippine Entertainment Portal). “Nakakapressure po talaga, pero mas excited kaysa pressured. “Sobrang taas ng ratings before, so nakaka-pressure. Derrick admitted that he grew up watching Mulawin back in 2004 and this made his inclusion in the new cast more meaningful. He said, “I’m happy sobra, kasi pinapanood ko siya nung bata ako. “I even sang their theme song in my voice competition sa school. INTENSE ACTION The announcement of Mulawin vs. Ravena promised a “leveled up” version of its predecessor. But for Mulawin vs. Ravena, physical training required him to become familiar with weapons. “Ito kasi arnis, e, so may weapons kami.